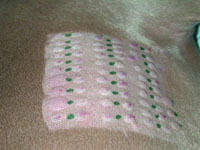 This is a procedure in which small amounts of allergens (e.g. pollens, dust, molds, insects, etc.) are injected into the skin in order to determine if a patient is allergic to these substances. This is considered the "gold standard" test in veterinary medicine. 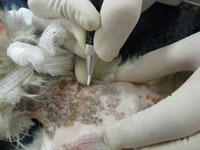 Dermatohistopathology: A procedure that entails taking a tiny section of affected skin from your pet. The skin can then be processed and observed on a microscopic level to help determine what type of skin disease your pet has. Dr. Senter is trained in dermatopathology and interprets most of his biopsies. There are a wide variety of lab tests that can be performed to help identify problems with internal organ systems, check antibody levels against certain infections, and monitor for possible side effects to medications, to name a few. A quick procedure that entails using a dull blade and mineral oil to gently scrape the surface of the skin and collect a sample. This sample is then placed on a microscope to look for mites that live on the skin or in the hair follicles. A procedure where liquid nitrogen is used to quickly freeze and eliminate skin tumors. A fiber-optic scope that enables us to visualize and perform procedures on the ear canal and eardrum much better than with old-fashioned handheld otoscopes. We can clean the ear more thoroughly and more safely through tiny channels in the scope along with our special suction and flushing apparatus. Our laser is used for removal of masses or warts on the skin or in the ears. It cauterizes blood vessels as it cuts and sears the nerve endings making it a bloodless and minimally painful procedure.